Rolls-Royce powers over half of the region’s widebody fleet, with 20% of Trent engine orders coming from Chinese operators. Paul Freestone, Rolls-Royce Senior Vice President – Customers, Civil Aerospace, who attended the ceremony, said: “We warmly congratulate both Sichuan Airlines and Airbus on the delivery of the first leased A350 to mainland China. The A350 has enjoyed truly global success and this is another new chapter in that story. The Trent XWB is the fastest selling wide body jet engine ever, with over 1,700 ordered by 46 customers worldwide. It recently achieved two million flying hours and the 500th engine was delivered to Airbus, a sign of the programme’s rapidly growing maturity. 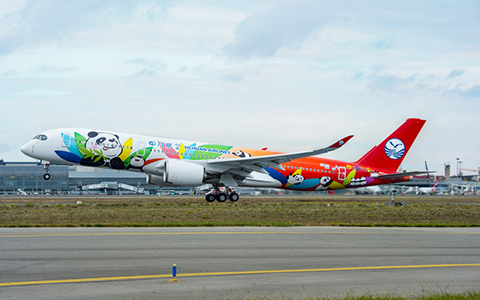 Sichuan Airlines has leased four A350s, and has also ordered a further ten of the aircraft. It also operates an all Airbus fleet, including 12 Trent 700-powered A330s.